Tonight the 84th annual Academy Awards, more commonly known as The Oscars, will be televised live in more than 100 countries. Viewers across the world will tune in to see who The Academy of Motion Picture Arts and Sciences selects as this years award winners. War Horse, Moneyball, Extremely Loud & Incredibly Close, The Help, The Tree of Life, The Descendants, and The Artist are all up for Best Picture of the Year. Other most anticipated awards of the night go to best Best Actor and Actress in a Leading Role, with this years Oscar nominees including Brad Pitt (Moneyball), Gary Oldman (Tinker Tailor Soldier Spy), George Clooney (The Descendants), Jean Dujardin (The Artist), Demian Bichir (A Better Life), Meryl Streep (The Iron Lady), Rooney Mara (The Girl with the Dragon Tattoo), Michelle Williams (My Week with Marilyn), Glenn Close (Albert Nobbs) and Viola Davis (The Help). With nearly twice the reach on Facebook than the next most popular film, War Horse wins according to its popularity on Facebook. The film’s fan base is 80% female, with the majority over the age of 40. Moneyball would follow in popularity, with Extremely Loud & Incredibly Close not far behind. 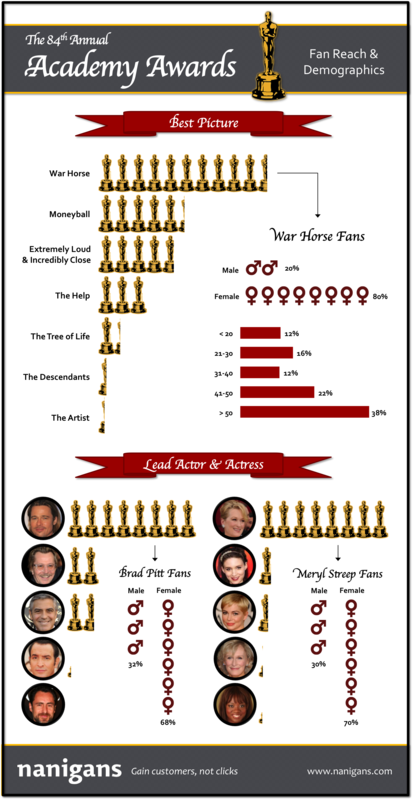 As for lead actor and actress, Brad Pitt and Meryl Streep far exceed the Facebook reach of other Oscar nominees. As with War Horse, it seems that more females than males are interested, at 70% and 30% respectively.